We have come a long way since starting our little cottage industry. 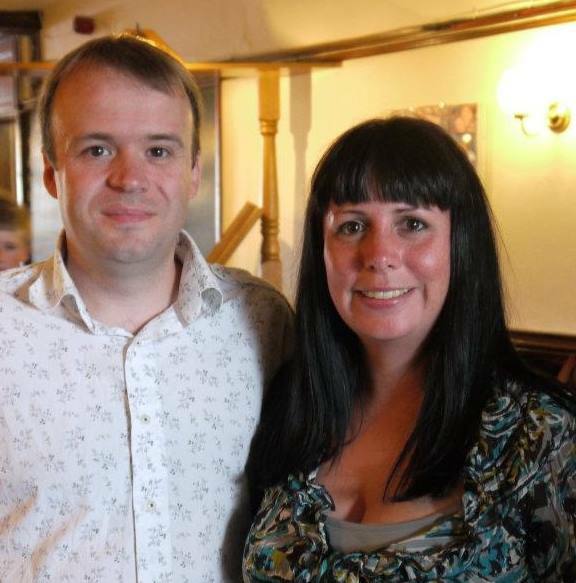 At the beginning of our soap making venture, our main objective was simply to make sure we produced a safe, quality product that could be presented in an attractive way. It is the first part that proved the easiest to achieve. The presentation aspect has been something of an interesting journey. 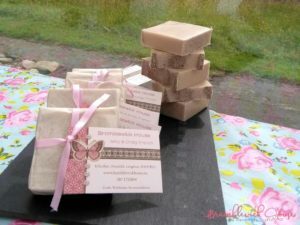 Initially our handmade soaps were wrapped in paper and ribbon with a card label. This product packaging looked simple & attractive. Unfortunately, we soon realised that this packaging would not be suitable as our soaps are high in glycerine, which is a humectant (a substance that retains or preserves moisture and absorbs it from its surroundings), so our soaps ended up sweating. This made the packaging look undesirable, and made it difficult to store and transport between outdoor markets that we were attending. 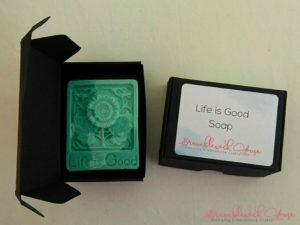 The only solution that we could use to ensure that our luxury soaps reached the customer in perfect condition was to shrink wrap them which we discovered is actually a lot of fun to do. However, that was only half of what we needed. Due to the amount of information that we are required by law to have on our soaps, we needed to have some kind of extra packaging on which to display it. We started using little organza bags, with little labels tucked inside. These were pretty but after a few markets decided that they were not quite what we were looking for. 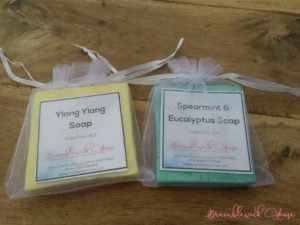 I think it was at this point, we decided that we needed to have packaging that we could use not only our soaps but which would also tie in with all of our other products. Whenever we are looking for supplies to fulfil an idea, we always first search Ireland for what we want but on this occasion could not find it, so we searched the UK and found Eco-Craft. Not only do they have recycled soap boxes, card and labels, we found that they also supply food grade biodegradable cellulose bags. You know when you have that moment when you look at something and you just know that is it? Well we had that moment with Eco-craft; they had everything that we needed and set us down our new packaging route. 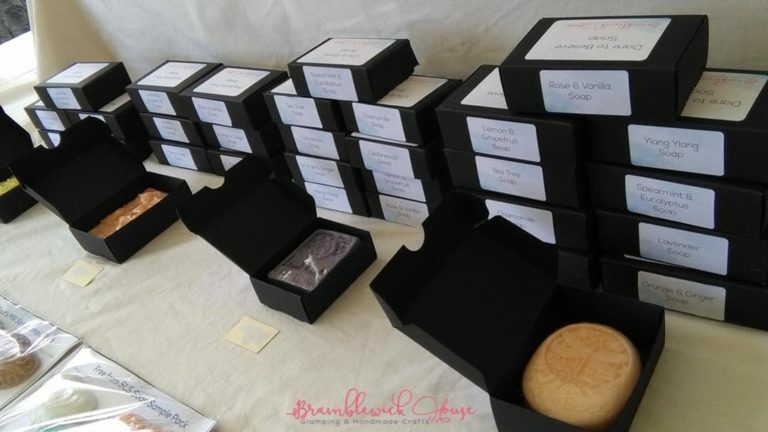 As we use up our old packaging for our soaps, we have been repackaging with the recycled boxes, card and label. 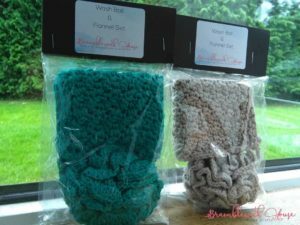 At the moment, we still shrink wrap our soaps but we are planning on testing how they react to being stored in direct contact with the cellulose bags that we are now using for our crochet flannels and wash balls. At this point we are really excited about how our new branding is coming together. Next on our list of things to do are our wonderful hand-made soy candles. At the moment, they are packaged in white card boxes, which can go into your recycling bin. Our plan is to replace these with black recycled boxes, with recycled labels, to match our other packaging. Fingers crossed this will happen VERY soon! !